The Spotted Tongue: Tug: Yer doin' it wrong? 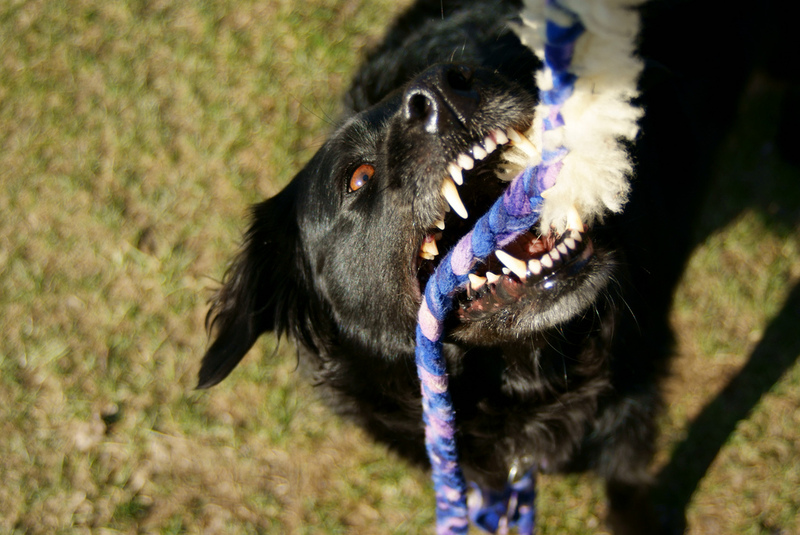 It wasn't all that long ago that most dog trainers advised people to not play tug (commonly called "tug of war" back then) with their dogs as it could lead to problems. The dog would become dominant. The dog could even become aggressive. This was especially true, according to these trainers, if the dog won the game. If you were going to play such an aggressive game with your dog, then you better make sure you could win it each and every time in order to show the dog who was the alpha. There are, in fact, some trainers who still believe this. Cesar Millan (a TV personality who claims to be a "dog psychologist) says on his page about puppy development, "If you don't step in and discourage this kind of dominance-seeking behavior early on - or, worse yet, if you allow your puppy to "win" at dominance games such as wrestling or Tug-of-War - it could set the stage for more serious challenges to your leadership down the road." He's not the only one, however. Google "Tug of war and dominance" and you will find many such results stating the same thing. 1. You initiate the game of tug. 2. The dog must drop the toy immediately when asked. 3. Ask for behaviors in between sessions of tug. 4. If the dog's teeth connect with you, even accidentally, the game is over (one site even suggests leaving the dog alone in the room!). The trainers who suggest these rules are the cream of the crop: Grisha Stewart, Emily Larlham, Ian Dunbar, Jean Donaldson, Pat Miller. It's hard to argue with these folks and I suppose for most people following these sorts of rules will work well enough. 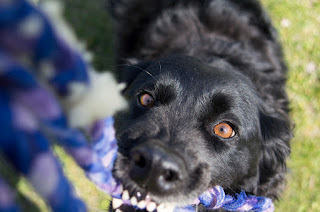 They aren't bad rules by any means and it certainly could mean a good rousing game of tug for many dogs! However, maybe because I come at it from a different standpoint than most, I play tug very differently than is recommended by the great trainers. I'm looking at tug as a way to get my dog "up" to play agility and as a way to increase my dog's confidence. Dahlia has a lot of tug drive. It's even a self-rewarding behavior for when she's done something good (like greet the children down the road nicely and calmly). But lately I've been working on getting her higher and higher and more and more ready to work by using tug. That's right. None. If she grabs the toy (or leash) first, that's awesome. I'm happy to see her do it. I don't give her a "drop" command as that ends the game and immediately calms her down. Instead, I "fight" to get the toy back (oh boy those dominance trainers would have a fit over that one!). I shove her around. I boot her in the sides with my legs. I yank the toy hard to try to slide it out of her mouth. Once she really has her mouth clamped down hard on it, I actually put my hand around her muzzle and pry that sucker right out of her mouth. This often causes some crazy growling and even barking. Oh boy does she get mad at me for that one! She'll leap for the toy, sometimes hitting me with her front feet, sometimes her teeth even connecting with my arm (she never bites down and I haven't gotten so much as a scrape or a bruise from this). If I put the toy behind my back she'll try to leap around me to grab it out of my hands. The game is fun. The game can be really tiring (for me!). And the game leaves her really up and ready to work. The difference between a Dahlia who is not up on the agility course and one who is up is dramatic. So no offense to those awesome trainers who I truly do respect, but tug doesn't always need those sorts of rules attached to it. I may be "doin' it wrong," but surely I can't be the only person out there to play tug with no rules!